Bitcoin poker is becoming an increasingly accepted concept among online poker sites and poker players in the US. Due to the anonymity that playing poker with Bitcoin presents, the easy transaction process and low processing fees, poker sites that accept Bitcoin as a deposit option are witnessing higher volumes of traffic and are able to cashout winning poker players much quicker. However, there is still a little “fear of the unknown” about Bitcoin poker – not just because players are using a decentralized currency to fund their betting actions, but because of the currency´s volatility. We aim to explain in every day terms what a Bitcoin is, and how it can be used to play online poker at a Bitcoin poker site. If you are not interested in Bitcoin, there are plenty of other options through real money games. So, What is a Bitcoin? A Bitcoin is a unit of “crypto-currency” – a digital peer-to-peer currency which is used to conduct transactions over the Internet. The number of Bitcoins in circulation increases at a predetermined level over the years until a finite number is reached and, because no individual (or Government) has control over the “Bitcoin protocol”, the value of Bitcoin fluctuates subject to demand and supply (rather than being artificially inflated by actions such as “Quantitative Easing”). Bitcoins are stored in “Bitcoin wallets” (think along the lines of PayPal, Neteller, Click2Pay, etc), and can be converted into dollars (or other currencies) at a Bitcoin exchange. There are dozens of Bitcoin wallet providers and exchanges. Provided your poker room of choice accepts Bitcoin as a deposit option (a list is provided below), making a deposit into a poker account with Bitcoin is very easy. Once you have set up your Bitcoin wallet and made your first BTC purchase, simply visit the Cashier´s page on the poker site. On sites which accept multiple currencies, select the Bitcoin option and then introduce the dollar value of your deposit. A Bitcoin value is displayed at the current exchange rate and the 34-character address to which the payment should be sent. On the main page of your Bitcoin wallet, click on the button that says “Send Money” and then copy and paste the 34-character address into the “To” field. Then add the Bitcoin value that you wish to deposit into the poker account and click “Send Money. The only difference with Bitcoin exclusive poker sites is that the 34-character address is displayed immediately and you simply copy and paste the address into the Bitcoin wallet and transfer how many Bitcoin (or fraction thereof) you wish to deposit into your poker account. The funds will normally be displayed in the poker account within 10-15 minutes, and can be used to play online Bitcoin poker immediately. At the time of compiling this page, Bitcoin poker withdrawals are only available on Bitcoin-exclusive sites. The process is equally as straightforward as depositing, with players simply entering their own 34-character address in the Cashier´s page, the amount that they wish to withdraw and their password. The minimum figure that can be withdrawn is usually very modest – typically 0.02 BTC – and transactions take around 12 hours to process and 30 minutes to complete. Players who deposit into multicurrency online poker rooms with Bitcoin will have to use an alternative payment solution to withdraw their winnings; but the multicurrency sites offering Bitcoin poker deposits are very accommodating, and will help with payment processing issues via their Live Help feature. Although a bit of a nuisance to sort out an alternative withdrawal method, this policy does protect the player from negative fluctuations in the value of Bitcoin. Protect your cash and personal information and make banking easy by playing at the best bitcoin poker sites. Once funds are in your poker account, playing poker with Bitcoin is no different than using dollars to buy into a table – indeed, multicurrency poker sites that accept Bitcoin as a payment option will credit your account with the dollar value of the Bitcoin transaction, so you should notice no difference at all! Players on Bitcoin exclusive poker sites only need to have a sense of bankroll management to monitor how much to bring to a table and move up or down the stake levels according to their performance. There is no need to worry about “how much is that is dollars” because the math of bankroll management works in any currency. There are a number of rumors circulated about Bitcoin and questions asked about the legality of the currency. 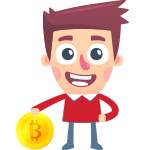 If you are apprehensive about any aspect of the Bitcoin currency, you are advised to visit the BitcoinTalk forum, where questions from “Newbies” are welcome and answered appropriately. Importantly, if you are a profitable poker player in the US, playing poker for Bitcoin does not exclude you from declaring your winnings to the IRS! In terms of playing poker at online sites that accept Bitcoin, it was once upon a time true that the sites were heavily populated by “currency libertarians” who did not have a clue about how to play online poker and were easy game. Unfortunately those days are now gone as the concept of playing Bitcoin poker online has become more widely accepted among experienced poker players and as the currency libertarians ran out of money!